Are you looking for a special idea for a present? Then why not visiting one of the GOLD to go® Gold-ATMs in Portugal. combines innovative technics with the functionality of a common product dispensing machine. Depending on the stock, the ATM can hold gold bars between 1 gram and 250 gram, as long as gold and silver coins. Seasonally it also can be filled with other products like jewelry. Did you ever buy gold at an dispensing ATM? Buying at the ATM can be in cash or cashless. Secure, discrete and anonym. The Gold-ATM is located in Cascais, or to be more precise, in the Cascais Shopping Center "CascaiShopping". Among shopping stores you can find cinema, restaurants and your aim to an extraordinary tourism souvenir. The shopping center is only 30km away from Lissabon in western direction, and so is perfectly reachable from the capital. Are you looking for a souvenir from Porto, then visit the Gaiashopping center. Here you can find next to shopping stores the well known Gold ATM from GOLD to go®, where you can buy real gold. If you are in the northern half of Portugal, you have the possibility to have this extravagant but noble moment. You get your product in an attractive giftbox. Anonym, diskrete and extravagant. 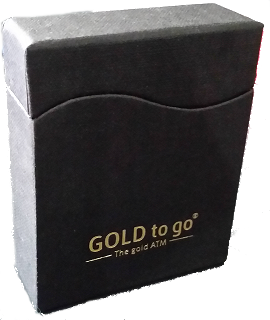 The GOLD to go® Gold-ATM. The Gold-ATMs in Portugal are operated by Valores.